I’ve been craving summer lately for many reasons - catching up with friends, the beach, pools, going down south to Dunsborough and Margaret River, Christmas, New Years, time off work, but also for the cocktails - my new obsession. A few months ago I set up this mini bar in my dining room. I bought an old small cabinet and then proceeded to cover it with all types of different spirits and liquors. Inside, it is filled with wine and champagne. So I have this rad mini bar, and haven’t really found the time to ‘mix’ anything. I found this recipe on the Gourmet Traveller website not long ago and book-marked it, waiting for the right time. Well seeing as I finally fixed part of my courtyard last weekend, and the outdoor table was clean, the chairs out, it was time to sit back and enjoy the beginning of summer with a cocktail! My lovely friend Anj came over and together we drunk the night away with this awesome Strawberry and Gin Cocktail. It was refreshing, light, not too sweet. Oh dear, I think I have found my new summer drink! And it’s red and green – perfect for the Christmas season. 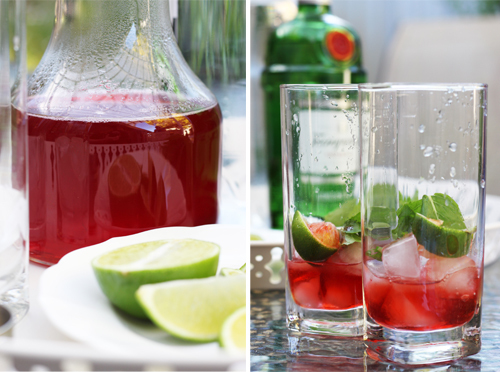 It’s given me ideas too… I’m thinking passionfruit and peach syrup – how nice would that be with mint and gin! Place the strawberries and water in a medium pot and bring to the boil. Reduce to a simmer and cook for 10 – 15 minutes or until the strawberries have broken down and become pulpy. Strain the strawberry mix through a sieve and muslin cloth so all seeds are removed. You should have about 2 cups of liquid. Return the juice to a clean pot add the sugar (you can add less if you don’t want it too sweet, but taste as you go – remember the syrup is watered down so you want it to be sweet). Bring the liquid to a simmer and stir until all the sugar is dissolved. Continue simmering for 5 minutes. Remove from the heat and add the vinegar and stir. Set aside to cool completely. 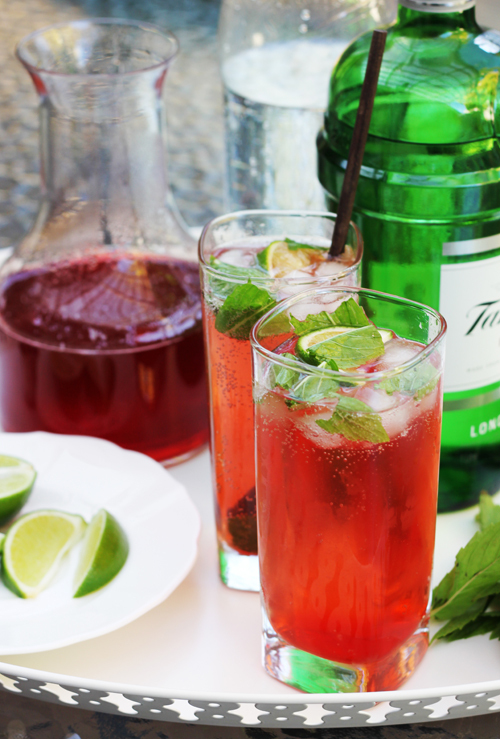 To make the cocktail, in a tall glass with ice, squeeze in two lime wedges, rip in a couple of mint leaves, add 60 mls of the strawberry syrup (two shots), 30ml of gin (one shot) and top it up with soda water. Give it a good stir and enjoy! I'm thinking I could probably drink about 10 of these! this looks AWESOME. i could use one right now! Wow! This drink was amazing. SO amazing it kept disappearing from my glass. A very refreshing drink with a lovely sweet aftertaste. Looking forward to having it again on a balmy summer evening. yummo. I wish it was warm and summer-y outside so I could make these delicious cocktails. Gin is the best so any cocktail with it is that much better! yumm what a perfect drink! Mmmm this looks good. 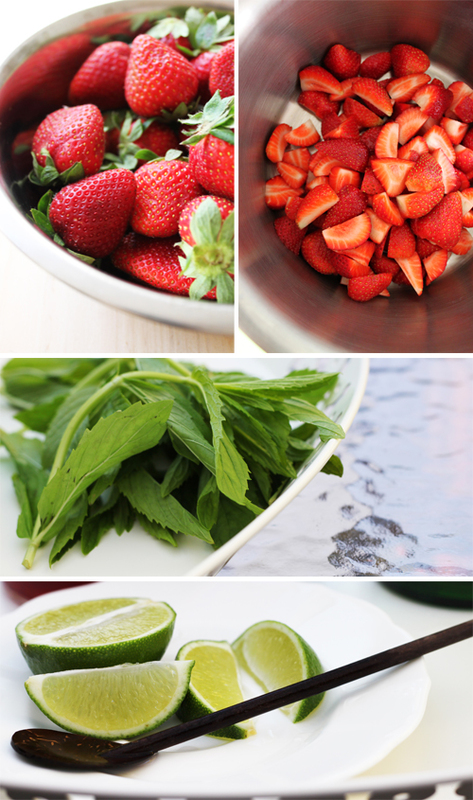 I love strawberries so this drink will be just perfect! Let me prepare the cocktail. By the way thanks a lot for your step by step guide for the preparation of the cocktail.